Barganier’s ability to form a strong memory of what she saw outside her house was necessarily limited by critical factors such as lighting, distance, and exposure duration. Law enforcement officers investigating this case used a number of highly suggestive identification practices that are now known to contaminate eyewitness memory: a hypnosis session, multiple identification proceedings conducted by those who already knew the identity of the suspect, and an array that was biased in its construction. By the time she testified at trial, Barganier had been exposed to much contaminating information that discernibly influenced and changed her account of what she had seen. Despite having failed to identify Charles in an out-of-court identification proceeding shortly after the incident, Barganier finally made the identification in a highly suggestive in-court identification procedure many months after the crime. The Innocence Project brief also agrees that the scientific understanding of memory and the ability of hypnosis to distort memory and inflated confidence in false memories has developed considerably since the time of Charles’s trial. 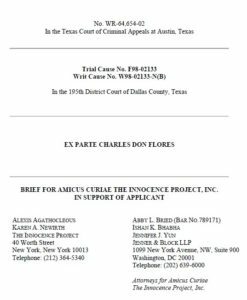 Download the Amicus Curiae Brief in PDF filed by the Innocence Project in support of Charles Don Flores.